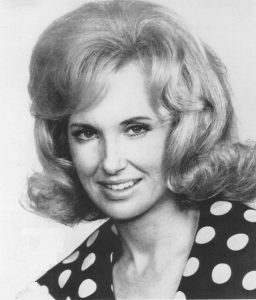 Tammy Wynette was one of the top female country singers of the 1960s and 1970s, with a unique, vulnerable, tear-tinged voice. Many women related to her songs about heartache, passion, marital woes, and parenthood, while many men found her music and stage persona alluring and inviting. 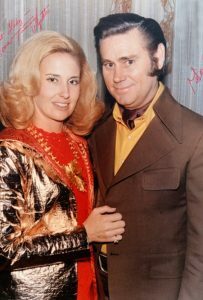 The personal life of the “First Lady of Country Music” often mirrored the troubles and tragedies she sang about, and her marriage to the legendary George Jones is one of the great real-life country-music stories of both love and breakup. Tammy was born as Virginia Wynette Pugh on May 5, 1942, in Itawamba County, Mississippi. She grew up on her family’s farm, where she picked cotton as a little girl. Her father, William, was a local amateur musician who died when Virginia was about eight months old. She grew up inspired by the guitars, piano, and recordings he left behind. She formed a gospel trio with two girlfriends when in her teens. One month before her scheduled graduation from high school, she married a construction worker named Euple, with whom she soon had two children. Euple was frequently without work, and the couple lived in poverty and moved often. Virginia worked as a waitress and shoe-factory employee before going to school for a beautician’s license. She divorced her husband while pregnant with her third child. After she got a job as a beautician in Birmingham, Alabama, she also began performing regularly as a singer on a local television program as well as in clubs. In 1965, when she was 23, she began visiting Nashville to try to get a recording contract by auditioning as a singer with producers. But she experienced repeated rejections. Undeterred by these early failures and determined to find success, she moved herself and her three young daughters to Music City USA in 1966. After she was settled in Nashville, Virginia got her big break when she auditioned for producer Billy Sherrill of Epic Records. Sherrill loved her voice, though he was not fond of her name. He suggested “Tammy” as being more appealing. In late 1966, Tammy scored a big hit with “Apartment #9,” which was co-written by Johnny Paycheck. More success quickly followed, with “Your Good Girl’s Gonna Go Bad” (1967), “I Don’t Wanna Play House” (1967), “My Elusive Dreams” (a 1967 duet with David Houston), and “D-I-V-O-R-C-E” (1968). Her 1968 recording of “Stand By Your Man”—widely viewed at the time as a traditional woman’s stand against feminism—remains one of the best-selling singles ever in country music. In reality, however, Wynette said she just considered it a love song—and she would be married five times during her life. Tammy singing “Stand By Your Man” on Johnny Cash’s television show. By 1970, Wynette had firmly established herself as a major performer with a series of hit songs and albums. Her chart successes during the 70s included “ ‘Til I Get it Right” (1972), “Kids Say the Darndest Things” (1973), and “ ‘Til I Can Make It On My Own” and “You and Me” (both 1976). Wynette is perhaps just as well known for having been Mrs. George Jones as for having been one of the most successful female singers in country music. The two married in 1969, following Wynette’s brief second marriage, to songwriter Don Chapel. Jones had a reputation as the greatest country singer alive—but also as a wild, hard-drinking guy who might not live so long. Tammy and George remained married until 1975 and had one child together—Tamala Georgette, in 1970. Tammy and George both admitted that the marriage failed mainly due to Jones’ drinking problem. A brief marriage to a Nashville realtor followed the divorce with Jones. Wynette married for a fifth and final time in 1978, to songwriter and record producer George Richey. Beginning in the 1980s, Wynette’s recordings reached the charts less frequently. A few of her later successes were “Another Chance” (1982), “Sometimes When We Touch” (with Mark Green, 1985), “Your Love” (with Ricky Skaggs, 1987), and “Beneath a Painted Sky” (with Emmylou Harris, 1988). In 1991, Wynette had an unlikely international electronic dance hit with “Justified and Ancient,” recorded with the British rave group KLF. Her popular 1993 album Honky Tonk Angels was recorded with probably the only two women who could be considered her contemporary equals in terms of country-music status—Loretta Lynn and Dolly Parton. Wynette had a career total of more than 20 number-one singles, many of which she co-wrote. Eleven of her albums made it to the number-one spot in sales. She was the first woman in country music to sell 1 million albums. She was honored with two Grammy awards and three Country Music Association Female Vocalist of the Year awards. One of Tammy’s last performances, with Lorrie Morgan at the Grand Ole Opry in 1997. Wynette’s personal struggles worsened from the late 1970s through the 1990s with a series of health problems and other tragedies. In 1978, she claimed she was abducted from a Nashville shopping center, beaten, and then abandoned on a country road by an unknown person. However, the daughter she had with Jones—Georgette—later expressed doubt at that story, proposing that her mother was covering up a physical fight she had with Richey. Wynette’s serious health problems were mostly related to chronic intestinal pain, for which she underwent numerous surgeries. The pain led to an addiction to prescription pain killers. On the evening of April 6, 1998, Tammy Wynette died in her sleep at her Nashville home. Later that year, she was elected into the Country Music Hall of Fame. Samantha Drake. The story behind Tammy Wynette’s tragic life. CountryLiving. September 15, 2017. Noah Berlatsky. George Jones and Tammy Wynette’s wonderful, heartbreaking, clumsy duets. The Atlantic. April 26, 2013. Tammy Wynette: The “Tragic Country Queen” [book review]. National Public Radio. March 14, 2010. Jimmy McDonough. Tammy Wynette: Tragic Country Queen. Viking, 2010. Tammy Wynette, with Joan Dew. Stand By Your Man: An Autobiography. Simon & Schuster, 1979.